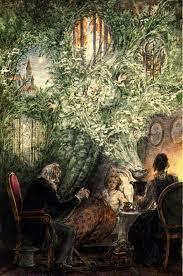 ovember 25th through December 23 marks the Celtic tree month of Elder, making it the 13th tree of the year. 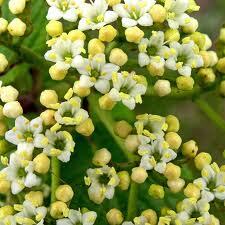 The word Elder is derived from the old Anglo-Saxon word “aeld” which means fire. If one removes the pith (soft center) from an Elder branch a tube is formed. These tubes were once used as pipes for blowing up fires. Bellows were also made from Elder for the same use. The Elder is kin to the Honeysuckle. This association can be seen in the Elder’s method of growth. At the base of a sapling, stems appear each growing upright. After they have grow to some length due to weight probably they bend over creating a curve on top of which a new bud appears. From this bud a new stem grows upright and the process continues. The stems can reach a size of two feet in diameter, which indicates several years of growth yet this size is not often found. 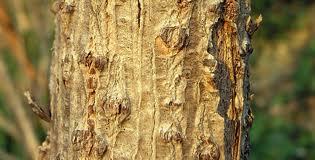 The bark of the Elder is rough, somewhat corky to the touch and light brown to grey in color. 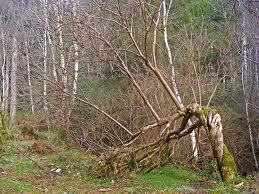 The branches however are smoother and its twigs are a bright green color. The wood of the Elder is hard and heavy. It is white in color and has a fine close grain. It is easily cut and polishes well. Some of the uses for Elder wood are small toys, fishing rods, and a variety of musical instruments. The leaves of the Elder consist of five leaflets attached to a central stalk. Once the leaves have formed its’ flower buds begin to grow and usually it is in full bloom by June. The flowers consist of five white petals. In between each petal there are five yellow stamens. Elder trees can commonly be found growing in old country gardens and often times cemeteries. This is because it was thought that wherever an Elder tree grew was considered a sacred space protected by the Elder Mother. Because of this the Elder tree has often been associated with death. In older times the dead was often laid out on Elder branches as well as crosses used as grave markers were made of Elder wood. It is believed if a cross made of Elder wood sprouts , it is a clear sign that the departed person whom it represents is happy and has been welcomed into Elysium, the blessed realm of the dead. Lovely posting - the year is certainly turning inward isn't it. The end of this lunar cycle will also bring the Ruis/Elder lunar cycle and then before you know it Yule will come.... And another year goes by. I didn't know the part about laying out the dead over the branches of Elder trees, but it makes perfect sense, as it does the fact that the trees are found near graveyards (easy access probably). Thanks so much for the info. I love your teachings I am learning so much I am even writing them down. Thank you again!